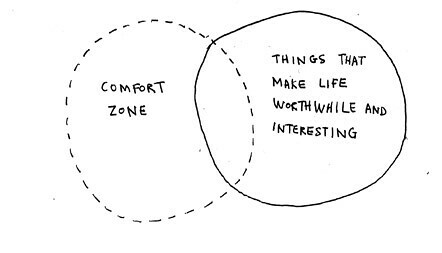 Yesterday I posted a cute graphic about getting out of your comfort zone. Today I want to talk about what that really means. For example, I am a fairly adventurous person. My comfort zone involves what is commonly seen as taking risks. because, you know, I want to try it! Guess what is out of my comfort zone ? As a child I lived in a really hostile environment. It was pretty much a given that things would be better if I didn’t exist. and I couldn’t wait to get out from under what I imagined to be their judgmental eyes and scrutiny. See what I’m getting at… ? It depends what you like, and it depends what you’re like. Dinner with old people? Oh help!!! Getting out of your comfort zone is good for EVERYONE. What constitutes an adventure for you? This entry was posted in Uncategorized and tagged astro-topics, comfort zone, Jupiter, Jupiter/Saturn, New Moon, Saturn, talking heads. Bookmark the permalink.